Jim Tate III Predator Trapping Bait -Wolfen Baits & Lures. 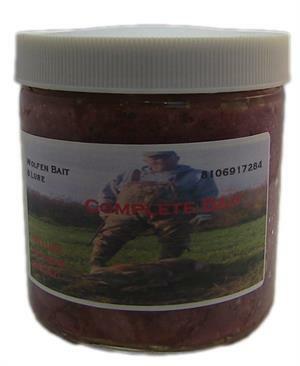 Complete Bait is formulated with 7 different wild meats in the bait along with some passion ingredients which really sets this bait apart from other predator baits. The smell says everything about this one, only need a teaspoon at each set. Also works great on Red Fox, Bobcats, Wolves & Grey Fox. A sure bait to use at dirt hole sets. Long Distance Call Predator Bait.